The majority of teams started their 2015 college baseball season this weekend. Each weekend, we will look at former PGCBL players who performed well and highlight three players. This week there are two players from the 2014 season and one from the 2013 season. Rankings are in no particular order. JaVon Shelby got the University of Kentucky Wildcats off to a 2-0 start with a 4-for-9 weekend, starting both games Kentucky played. Shelby slugged a home run on Friday night, when he went 3-for-5 with three RBIs, a walk and two runs scored. The Wildcats defeated Ball State, 11-7 on Friday and beat Richmond, 10-1 on Saturday. The sophomore started at second base for both games. He finished with four RBIs on the weekend. Kentucky is schedule to play four games this coming weekend, one against the University of Southern California and the others against UC Santa Barbara. Shelby played in 40 games for the Amsterdam Mohawks this past summer. The 6-foot-2 infielder from Lexington, Kentucky posted a .342 on base percentage and a .396 slugging percentage. He drove in 21 runs and finished with a team-high 12 doubles for the PGCBL champion Mohawks. Shelby was drafted by the Milwaukee Brewers in the 37th round of the 2013 MLB Draft. Matthew Thaiss led his Virginia team to a 3-0 start this weekend, hitting .500 with two home runs for the Cavaliers. Thaiss homered in both games of the team’s doubleheader against East Carolina on Saturday. The 6-foot catcher went 2-for-4 with a home run, a double, two runs and a walk in the first game of the doubleheader, a 9-2 Virginia win. In the second game, Thaiss again went 2-for-4 with a long ball. The Cavaliers won game two, 4-2. For the weekend, the Jackson, New Jersey native finished 5-for-10 with 12 total bases, a stolen base and a .615 on-base percentage. Thaiss was a late addition to the Watertown roster in 2013, but hit .333 for the Rams down the stretch. He posted a .455 on-base percentage and a .667 slugging percentage in five games played. Thaiss was drafted by the Boston Red Sox in the 32nd round of the 2013 MLB Draft. Note: Ernie Clement (Albany 2014) hit .333 in three starts for the Cavaliers and scored two runs. Mike Carter picked up right where he left off this summer. Carter, who won the PGCBL batting title, hit .375 for Rutgers University in the school’s first games of the season. Carter was named to the Big Ten Players to Watch list prior to the start of the season and in the first game of the season, went 2-for-4 with a run scored. Carter doubled against No. 9 Miami on Saturday and against the Hurricanes on Sunday, went 2-for-4 with another double and an RBI. 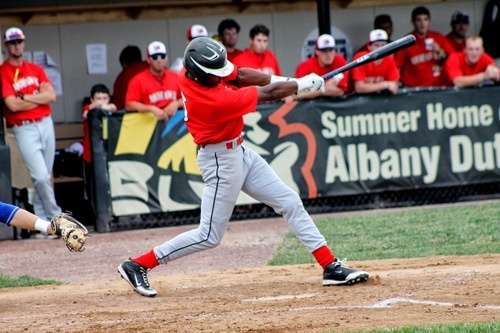 Carter was a 2014 Louisville Slugger Freshmen All-American and the 2014 NJCBA Rookie Player of the Year. This past summer, Carter led the PGCBL with a .430 batting average in 39 games played, a new PGCBL record. The Bloomfield, New Jersey native finished the season 58-for-135 and scored 37 runs, fourth most in the league. His 80 total bases were the most in the league and he posted an on-base percentage of .516. His overall OPS was 1.109 and he drove in 23 runs, despite hitting at the top of the order for most of the season. He was named to the first team All-PGCBL. Additional: Sean Spicer (Albany 2013) had two saves in two games for Baylor, pitching three perfect innings vs. No. 13 Cal Poly. For more information about the PGCBL, follow the league on Twitter, @PGCBLBaseball.